We are pleased to present this information on this gas-burning fireplace, as shown and described by Fireplace Xtrordinair on a product that can help to make your home more comfortable. Because we have not tested this product, we are unable to endorse it or provide you with any additional information. 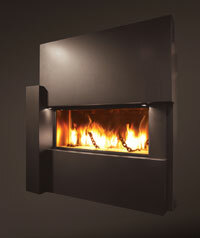 Fireplace Xtrordinair introduces the Xtreme to its line of gas-burning fireplaces. An elongated, breathtaking presentation of fire, the Xtreme continues the Fireplace Xtrordinair tradition of stylish and efficient fireplaces. The Xtreme features an exciting new fireplace configuration. With ten square feet of fire-viewing area, the elongated glass aperture adds a dramatic element to entries, family rooms, or outdoor living areas. The actual fire-burning appearance is panoramic—with no logs or visible means of combustion. Refracted firelight is cast upon pieces of fractured glass throughout the floor, reflecting light amidst a brushed stainless steel liner. Other options include a river stone floor for a more organic look and feel.